Cardio workouts are simultaneously my best friend and my worst enemy. Best friend because, well, let's face it, how else am I supposed to burn off all the calories from those delicious In-n-Out burgers and Krispy Kreme doughnuts? And worst enemy because in addition to being incredibly exhausting, it also is tedious and boring, especially when you're just listening to your own footsteps hitting the pavement or the treadmill continuously repeating its cycle. I had tried using the earbuds to listen to music. And as pleasant as it was to listen to music (I even had a whole playlist dedicated to working out), I hated having to carry my iPod in my hand. I also tried an arm band pocket for my iPod, which I thought would solve the problem. However I wasn't able to switch tracks very easily, which was kind of annoying. I also realized that the wire from my earbuds bouncing around was almost as annoying than hearing my own footsteps for a few miles. The GOgroove AudioACTIVE Bluetooth Headset was the solution to my problems. Or at least that little thorn in my life. 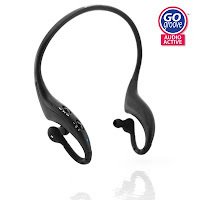 This comfy headset connects to your audio player through Bluetooth, so I never have to worry about carrying my clunky iPod Touch while listening to the Spice Girls during my morning workout. The design of the AudioACTIVE headset was obviously engineered with sports activities in mind. The headset comfortably fits in your ears and around the back of your head with a secure yet comfortable fit. On-board controls let me change the tracks playing, as well as control the volume levels. When my AudioACTIVE headset is synced with my iPhone, the built-in microphone and answering controls turns my headset into a hands-free calling device. Not that I would ever want to answer the phone in the middle of my run, but I've found this feature to be so handy and useful for other activities where my hands or shoulders are too busy to hold a phone. 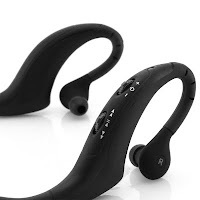 My AudioACTIVE Bluetooth Headset easily charges through AC or USB, and provides me with 7 hours of listening time, although I hope I'll never be working out for 7 hours straight. And the best part of all, no more annoying wires to deal with!